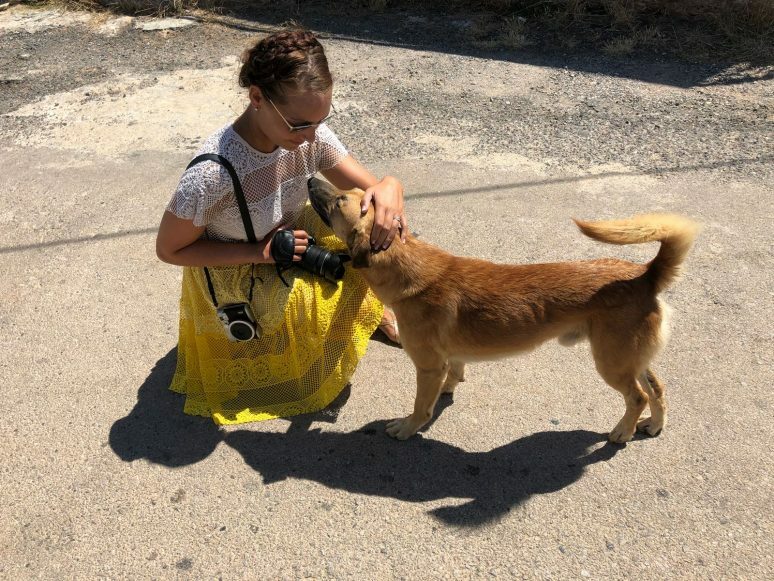 This August I had my first experience of Crete, and oh, what a beautiful experience it was. 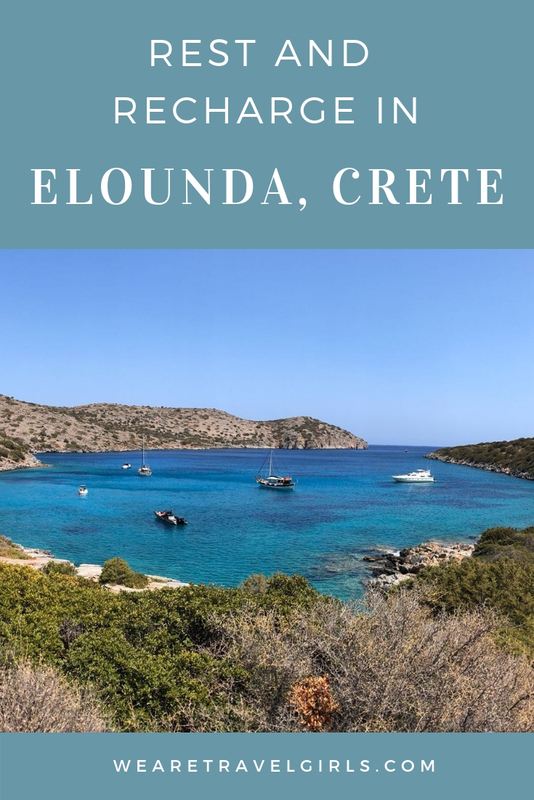 Crete has so many towns to tempt you but our destination of choice for our two weeks of bliss was a little village called Elounda. 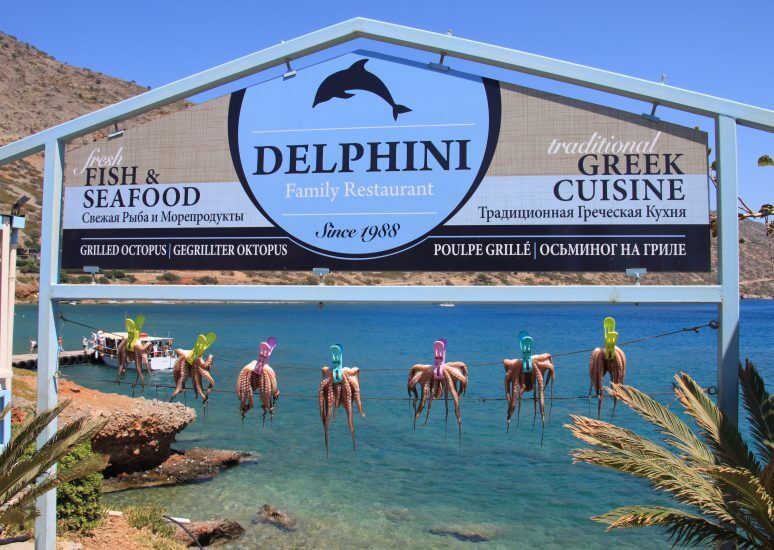 Elounda was once a small fishing village and still remains relatively untouched by tourism. 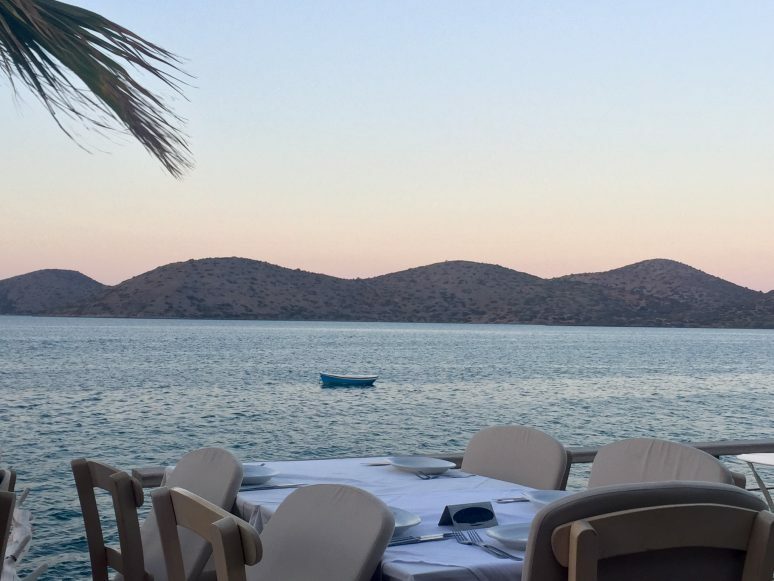 Unlike Malia just over the hill, where the party lasts all night, Elounda is the place to come for quiet, calm and incredible fresh Greek food! The path that runs along the waterfront is full of tavernas, bars, and restaurants, all offering the most incredible delights. I have written a couple of reviews of my favourites for Tripadvisor.com, but if you find yourself stuck for where to eat I would always recommend ‘Olondi.’ I had the best seafood I’ve ever tasted at this restaurant – it was so good and the staff were so warm and welcoming that we actually ate there three times! If you’re a seafood lover like me I would strongly suggest trying the seafood risotto which was full to the brim with prawns, octopus, and mussels. Or if there are a couple of you, then try their ‘Fish Fantasia,’ the most seafood I’ve ever seen on a plate plus a whole grilled sea bream, yum! One of my favourite days of our trip was an adventure over to Spinalonga, a small island which faces Elounda and its neighbouring village Plaka. The tiny island once belonged to the mainland of Kalydon but was separated by The Venetians centuries ago. 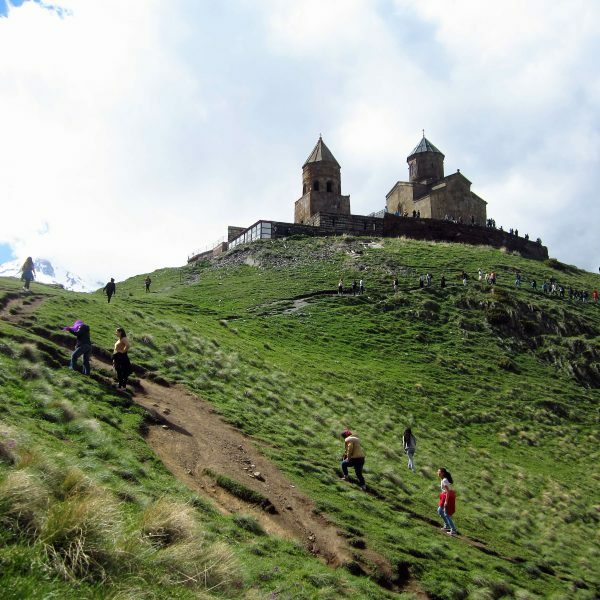 It’s more recently remembered for being a leper colony, which is how it was used all the way up until 1958 when the last leper, a priest, left the island for the last time. The lepers were taken on boats from Plaka to live out their days away from the mainland, but close enough so that they could see the lives they were missing out on. This tiny place was made famous by Victoria Hislop’s book ‘The Island’ and has injected a lot of curiosity into travellers in this area of Crete. Spinalonga is a 20-minute boat ride across the sparkling turquoise water from Elounda’s main square and harbour and costs €12 for a return journey. Make a note to take your own bottle of water across with you from the mainland as the island only has one shop/bar where they charge a fortune! The island itself is now pretty much ruins of the streets and churches lived in by the lepers, but it’s really quite beautiful and sad in equal measures. The views across the water to the mainland are stunning but must have been absolute torture to look at every day for the people who were stuck there. I couldn’t get my head around the fact that these ruins weren’t that old, and would have been lived in as recently as 60 years ago. Another highlight of our Cretan adventure was an afternoon spent on a little red road train, known as ‘The Happy Train’. This was a four-hour excursion from Elounda Beach which cost €18 per person. The little train took the waterfront road along to Plaka which has undisturbed views of Spinalonga. We were able to walk through this tiny village which is made up of only a handful of tavernas and a few shops. I was fascinated by the freshly caught octopus hanging out to dry, like washing on a line, alongside tanks of lobster, all ready to be ordered that evening. The train met us on the other side of the village and then we started our climb into the mountains. When I tell you the views were stunning from up there, I mean they were so gorgeous I could have stood there for hours just breathing it all in. Elounda is pretty much surrounded by mountains or water so to look down over this pretty jewel of a village felt so special. We then continued further up into the mountains and over the other side where we were taken to two tiny mountain villages. The last village we reached was called ‘Seles.’ We were greeted by the village dogs with the warmest welcome and waved to by an elderly lady who came out of her tiny house to say hello to us. The village is home to only ten families and it felt like a tiny glimpse into a life that I will never get to experience. A life where the bus only comes once a week to take locals into a bigger town. A life where the only shop is a bakery and the average age is sixty! A life where mobile phones will have no use and the pace is almost at a standstill. 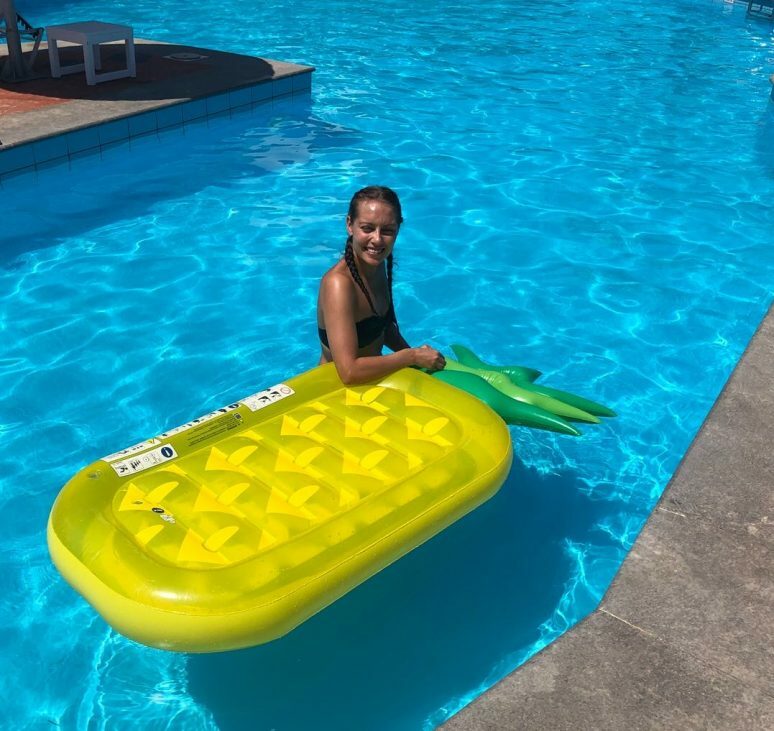 I wouldn’t be able to function here for a long time without going a little stir crazy, but this little peek into the mountain village lifestyle definitely made my brain slow down and reminded me to appreciate all of my luxuries. 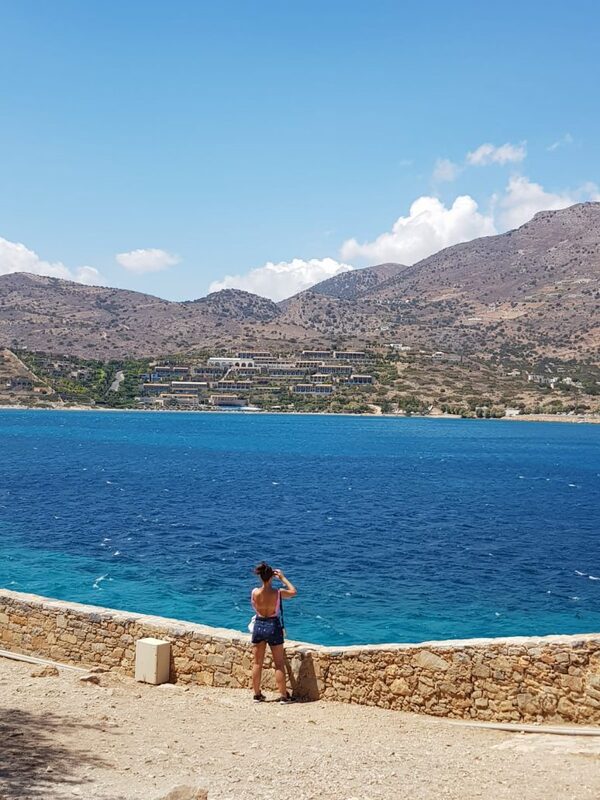 I returned to Elounda feeling incredibly lucky and grateful for all that life provides for us and being in the fortunate position to even be on this holiday – Mind and heart well and truly reset! There is also a causeway over to Kalydon island which is home to a beautiful Art hotel and cafe. After a little wander along the shore, we decided to follow the little red and white spots that were marking out the route of a scenic walk/hike! The walk ended up being an 8km/4 hour trek around the entire island, but it was so worth it. We were completely alone on our walk and didn’t see another person apart from those anchored up in their yachts in the tiny blue alcoves, pure bliss! The last thing that deserves to be talked about are the people of Elounda. We felt welcomed wherever we went, whether it was to a restaurant or just walking along the road from our hotel. Every evening we passed a little restaurant called ‘Thea’ on our walk towards the water, and every evening without fail the owner would wave and smile. We ended up eating in his restaurant twice and the hospitality was perfect! The same was true of Yannis, the owner of ‘Olondi’ who chatted and showed us photos of his farm and his animals which he was obviously incredibly proud of. We literally felt like family being welcomed home, even though we’d never been to their village before. 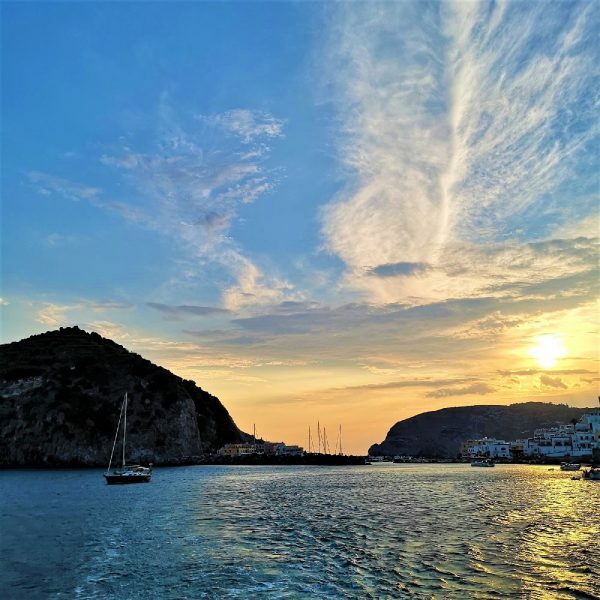 I’m sure there were other incredible excursions we would have loved and bigger cities like Agios Nikolaos that we could have spent more time in, but for me, these few trips were absolute perfection. 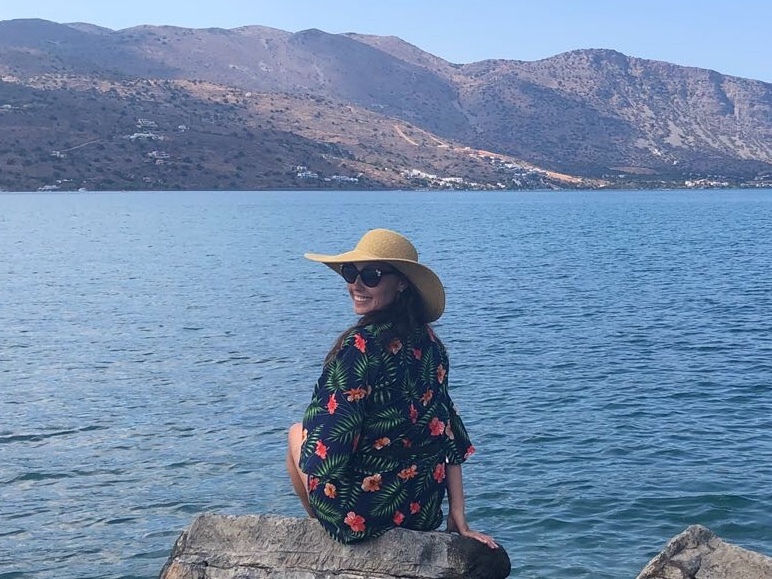 The sun, wonderful food, and gorgeous people just made Elounda the dreamiest place to recharge. If you find yourself on the north side of Crete for a few days I couldn’t recommend it more. Have you ever been to Greece? If you have any additional tips for our readers or questions please leave these in the comments below. Fantastic piece about our love, the village of Elounda, Thank you. I will repost on twitter and to Yanis . 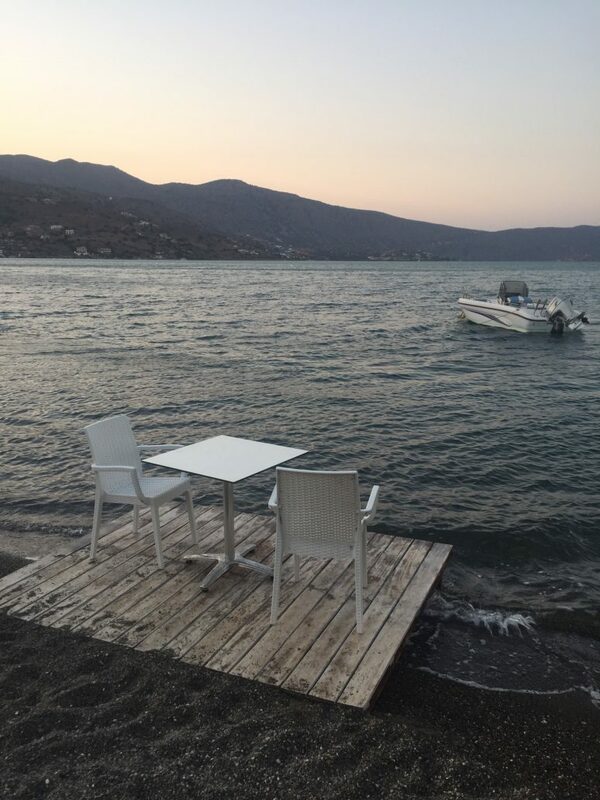 Crete is a busy island during peak tourist season, but Elounda can offer an escape from that. Although it does get some travelers, it isn’t nearly as busy as some of the other spots on the island. Rather, it feels tucked away and provides a nice, relaxing haven for those looking to get away from it all.